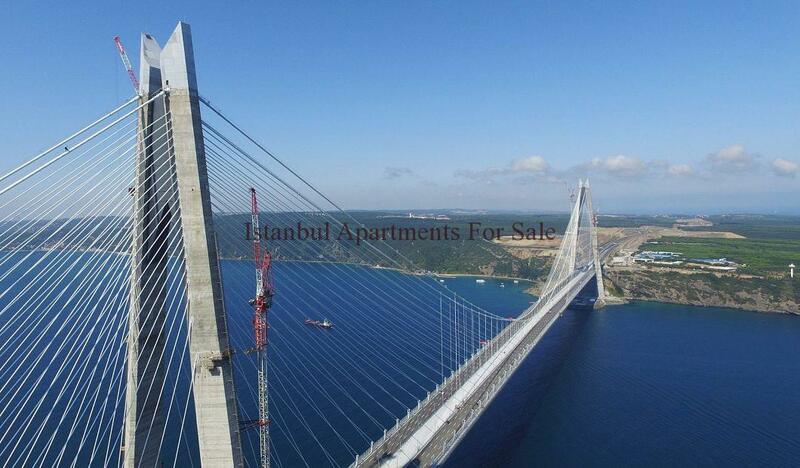 Istanbul’s third bridge Yavuz Sultan Selim rises residential property prices along the route. 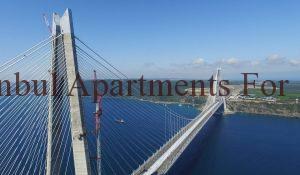 The real estate properties in districts situated along the course of the Yavuz Sultan Selim Bridge, the recently built third bridge, have seen an rise of up to 43 percent in their value. The Yavuz Sultan Selim Bridge, Istanbul’s recently built third bridge to connect the city’s European and Asian sides, is giving a lift to real estate property market prices along its route, as indicated by data from Sahibinden. Correspondingly to the real estate website Sahibinden.com’s Sahibindex real estate index, the typical price of residential properties per square meter in the Istanbul districts of Çatalca, Sarıyer, Arnavutköy (Hadımköy quarter) and Beykoz, all situated along the bridge’s course, have seen an gain of 4.9 percent, 17.8 percent, 34.9 percent and 42.9 percent, respectively, in comparison to January 2016. The January 2017 Sahibindex real estate index registered that residential houses for sale in Çatalca reached about TL 2,223 ($613.3) a month in 2017, whilst the average price per square meter for residential houses in Sarıyer jumped to TL 10,701 and the price of houses per square meter in the Hadımköy quarter of Arnavutköy increased to TL 2,371. Beykoz was the area whose real estate market was most influenced by the Yavuz Sultan Selim Bridge. Situated on the Anatolian side, the normal price per square meter of residential properties in Beykoz expanded to roughly TL 9,032 contrasted with a same period a year ago, indicated by the index. The Yavuz Sultan Selim Bridge has pushed up the real estate market prices in the areas situated along its way since development works began in 2013. The Sahibindex real estate index additionally demonstrated a three-year change in the square meter costs of residential properties on the market. As per the information, the normal cost per square meter expanded by 55.7 percent in Çatalca, 17 percent in Sarıyer, 89.9 percent in Arnavutköy-Hadımköy and 77.5 percent in Beykoz. The bridge, built over the northern part of the Bosporus Strait, was named after sixteenth century Ottoman Sultan Selim I, whose rule denoted the extension of the empire’s burgeoning world power in the Middle East. Named after Selim I, the bridge goes with the July 15 Marytrs’ Bridge – beforehand the Bosphorus Bridge – and the Fatih Sultan Mehmet Bridge in crossing the Bosphorus. All trucks and heavy-duty vehicles will be coordinated to the bridge to lessen traffic on the other bridges, in addition to cut crowding and pollution in Istanbul. Turkey’s government has ensured operators that 135,000 vehicles will utilize the bridge every day. The fee for automobiles going from the European to the Asian side will be TL 9.90 ($3.40). There will be no charge for entry from the Asian to the European side. The Yavuz Sultan Selim Bridge cost almost $3 billion and is a critical segment of the Northern Marmara Highway. More than 6,500 workers and engineers worked diligently on the construction of the Yavuz Sultan Selim Bridge. The total length of the bridge is 2,164 meters. The bridge, which stretches 1,408 meters over the Bosporus, has eight lanes of highway and two lanes of railway. It will be the longest suspension bridge in the world that includes a rail system. The height of the tower in the village of Garipçe on the European side is 322 meters and the tower in the Poyrazköy district on the Asian side is 318 meters high. The bridge will have the highest abutments in the world. The rail system crossing the bridge will run from Edirne to İzmit, will be integrated into the Marmaray and Istanbul Metro and will also connect Istanbul Atatürk International Airport, Sabiha Gökçen International Airport and the third airport, also currently under construction.